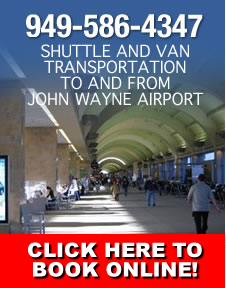 Another one of John Wayne Airport Shuttle Association destination is the Anaheim Convention Center. Our Anaheim Convention Center Shuttle van will pick you up directly from John Wayne / Orange County Airport (SNA) and take you to the convention center. If you are flying into John Wayne Airport for a convention at the Anaheim Convention Center, let JWACC Shuttle take care you. Our Anaheim Convention Center shuttle vans will take you from the airport when your flight arrives to your hotel or directly to the convention center. When going back to the airport, our Anaheim Convention Center airport shuttle will get you back on time for your flight. The Anaheim Convention Center is the largest convention center on the West Coast due to recent renovations and additions. The Convention Center has 800,000 square feet of exhibition space and 1.4 million square feet of total exhibition space and meeting rooms. This beautiful facility showcases a wall of glass that curves like an ocean wave as it rolls onto the shore. The new facility can host any type of meeting with 52 meeting rooms, each equipped with the latest in lighting, sound, and exhibition equipment. The center was first built in 1967 and has since undergone three expansion and several beautification projects. Newly constructed meeting and ballroom space totals 130,000 square feet, which occupies the second and third levels, directly above the exhibit halls. The center is located within walking distance of Disneyland and California Adventure theme parks, and many hotel and motel options. Though named after the hundreds of orange groves that once dotted this temperate land, Orange County is no longer filled with the scent of citrus blossoms. Instead, OC has replaced its former farming society with a high tech suburban lifestyle, making it an excellent destination for business travel with easy access to The Anaheim Convention Center, Irvine's biotech headquarters and Newport's financial district. John Wayne Airport Shuttle Association reprensents the shuttle and van drivers operating out of John Wayne Airport in Santa Ana, California. The association serves all of Orange County California specializing in Anaheim Convention Center Shuttle services to and from John Wayne Airport and LAX.